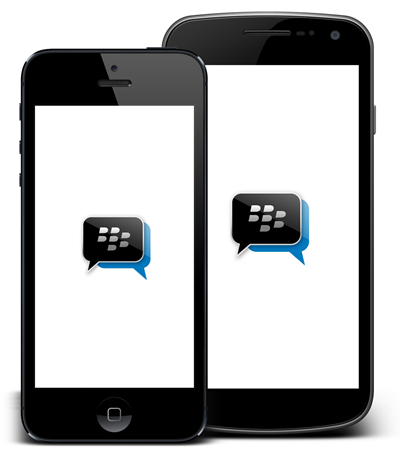 BBM For iPhone And Android Release Date Accidentally Leaked By T-Mobile UK? BlackBerry Messenger (BBM) has hitherto been an exclusive flagship feature of the BlackBerry platform, but with the company having recently announced its decision to allow the instant messaging service to fly the nest as it were by crossing platforms to both iOS and Android, it now looks as though BBM for iOS and Android may just be a few weeks away now. According to a tweet sent out by T-Mobile UK, which was later pulled for reasons unknown and have also raised doubts, it’s going to be hitting the App Store and Google Play Store on June 27th. In the initial announcement, BlackBerry cited the reason behind opening up BBM to wider audiences was one of confidence, in that the new BlackBerry 10 OS and associated devices could cope without the pull factor of the proprietary chat service. But that was all bluster of course, since if BlackBerry’s well-documented fall from grace hadn’t have occurred and the company still remained among the big players in the mobile game, there’s just no way BBM would have been shared. Still, the motives don’t particularly matter, because whether BBM is relevant or not in the days of GTalk, iMessage and WhatsApp, it’s coming; and people are talking about it. Like most folks, I did own a BlackBerry Bold many moons ago, and I don’t really know whether to be excited about the release of BBM for my iPhone and Android smartphone. I mean, when you ditch BlackBerry, most from within your group tend also to be making a similar transition, and having now sorted out a routine for keeping up with friends by combining WhatsApp, Facebook Messenger, iMessage and SMS (sounds more complicated than it actually is, trust me), slotting BBM in there would just seem like a burden. Then again, the amount of people still using BBM cannot be discounted, and with most people likely to try the app out of sheer curiosity, I certainly wouldn’t write off its chances of branching back out and helping the BlackBerry cause. The question in the end remains whether or not the tweet sent out by T-Mobile UK is credible or not, since it has been removed after all. To put it in fair words; even we’re confused regarding the tweet’s legitimacy. What do you guys think? 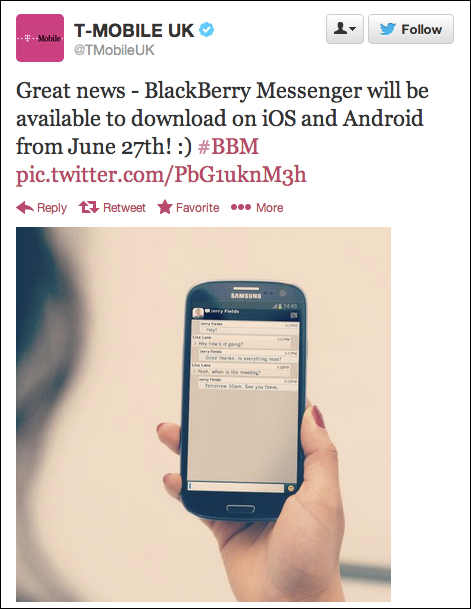 BBM on June 27th or not? We will, of course, let you know when the app does arrive, so stay tuned to our coverage here at Redmond Pie! Be sure to check out our iPhone Apps Gallery and iPad Apps Gallery to explore more apps for your iPhone, iPad and iPod touch, and also our Android Apps gallery to discover more apps for your Android device.